In 2001 I was living in an area of Oakland just off of Piedmont Ave. My future wife had found our apartment on a job hunting trip while I was still living in Houston. I don't remember the exact square footage of the apartment, but if someone told me it was less than 400, I wouldn't argue with them. It was tiny to say the least. The apartment could have been 200 square feet and I wouldn't have cared after I found out there was a great comic book shop within walking distance called Dr. Comics and Mr. Games. I started going there every Wednesday for new books. They had all the stuff you would expect, but they also had a section with independent publishers. I owned comics and books that weren't from the major publishers, but most of them were still superhero/action/adventure stories. I did have a friend who was more into the independent scene and he had been telling me for awhile to check out Dork! by Evan Dorkin. I saw that Dr. Comics had issue three and picked it up one day, probably with a stack of Vertigo and Alan Moore comics. I loved Dork! It was filled with gags and short strips. A classic humor book that reminded me of how much Mad Magazine had cracked me up when I was a kid. I did some searching online in those early days of the Internet and I came across Evan Dorkin's web site and eventually got a reference to an interview with him in The Comics Journal. I liked the name, since I was working in a library at the time, and thought it lent some credibility to the topic. My next time at Dr. Comics I checked the shelves to see if that had any issues of The Comics Journal and I found issue 241. This cover brought me back to my childhood tromping through the snow in North Dakota. It occurs to me now, years later, that Scott McCloud made some kind of argument in Understanding Comics that the more simple the drawing of a human the more the viewer can see themselves in the drawing. I think it was Scott McCloud but I'm too lazy to look it up. Anyway, somebody said that. I enjoyed the approach taken by the Journal. They had an amazingly entertaining letters section. They covered comic books as an industry, including news stories that actually contained some journalism. They covered French and Japanese comics, too. When they talked about the mainstream it was always with a critical eye and without fanboy zeal. The heart of issue 241 was an interview with the cover artist John Porcellino by Zak Sally. Sally got Porcellino to open up about his years of making mini-comics, depression, buddhism, alcoholism and punk rock -- really his life story. I had never read an interview with another comic book creator like this one. I was dying to read some of Porcellino's work which he put out under the title King-Cat Comics, but Dr. Comics didn't have any. Porcellino mostly distributed his mini-comics through the mail to subscribers, but he did send some copies to stores. I took my bike down to Berkeley and visited Comic Relief. These were the days before the owner Rory Root passed away and the store was like Mecca for comic book readers on the West Coast. I was thrilled to find the latest issue in their mini-comics section and I also found a copy of Perfect Example, a small collection of Porcellino's work put out by the now defunct publisher Highwater Books. Just like the interview with Sally the work was very raw and emotional, a kind of honesty I had never seen in comics. There was definitely a "Porcellino Effect" on my comic buying habit from that point on. It was hard to get caught up in the fictional soap operas of the mainstream stuff. I started exploring the catalog of Fantagraphics (the publisher of The Comics Journal) and Drawn & Quarterly. I was relishing the weeks when a new collection of the samurai drama Lone Wolf and Cub came out. These tiny volumes were originally put out in Japan with consideration towards small living spaces. I just loved that they were books roughly the dimensions of an index card. My weekly habit at Dr. Comics and Mr. Games turned into a visit on Wednesday and usually on Saturday or Sunday. We had a bookshelf in our living room that was divided into cubes, which I quickly filled. I had disposable income back then and a whole new world of comics to explore. I long for those days now. As a father with two kids I find it too difficult to rationalize the expense of comics now, and too impossible to find space for everything I want to read and own. I get some things digitally, which makes it cheaper and more space effective, but it's not the same as having a wall of glorious books. In 2002 (or maybe it was 2003) I got to "meet" John Porcellino at the Alternative Press Expo (APE). I didn't really say anything other than, "I'll take these," as I picked up every issue he had available of King Cat. I've been a subscriber since about 2002. Porcellino still puts out about an issue a year. You can find out more about his work here. 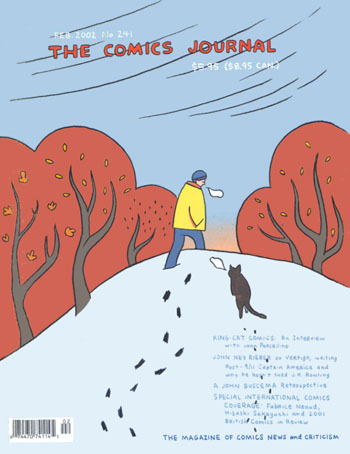 I would highly recommend becoming a subscriber and if books are your thing you should get all of his stuff, but my favorites are Diary of a Mosquito Abatement Man and his sublime adaptation of Walden by Thoreau. They’re worth owning. Even without space or money.